This renovation of a dated but substantial villa required the opening of several smaller rooms to create larger more coherent spaces. Whilst increasing privacy, this opening up has brought in much needed light and makes the most of the stunning views. The main living space has been opened both to the sunnier west, with a pool and associated loggia and also opens to the more private green space of the back yard. The master suite upstairs takes advantage of the views. Due to a subtle re-pitching of the roofline the addition appears like an attic space, no “pop-tops” here. Excavating under the entire footprint of the house enabled us to double the size without increasing the apparent bulk of the home and provided useful areas for the garage, media room, wine cellar, laundry, storage and a guest suite. Steel joinery has been used in the kitchen and living room to create a contemporary version of the traditional bay window and steel contemporary detailing throughout offsets the heavier existing villa detailing. These steel contemporary elements present as a parasitic insertion within the villa, creating new and blended spaces. Expressed on the exterior as black boxes bursting through the fabric of the original white weatherboards. 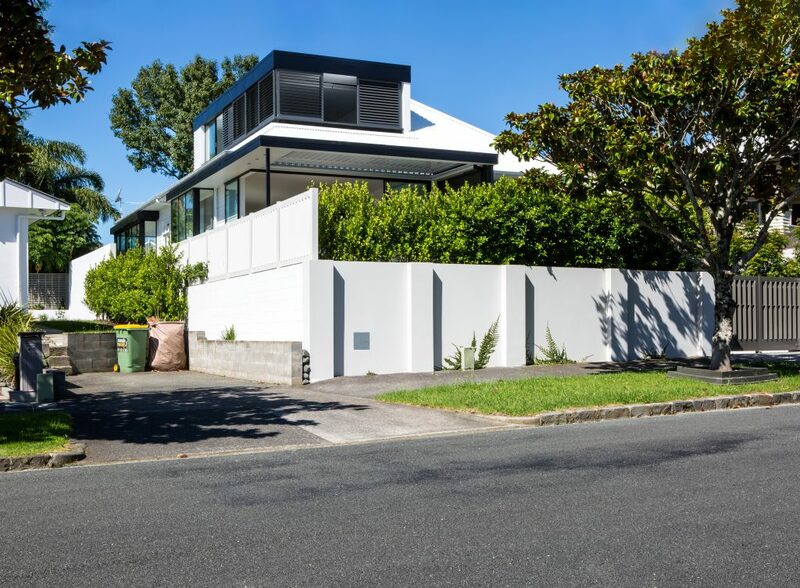 The weatherboards have been stripped off the home around the entry to be replaced by a large plate glass window, flooding the house with light this in turn responds to an existing green wall. A white on white interior palette highlights, with the use of concrete, glass and steel materials, the subtle coding between the new contemporary insertions in black and the existing villa’s overall white colour scheme.